To Have "Red Hat" Fun!!! "Social Butterflies are about friendship, fun, being silly, and Red, Purple & lots of Bling!! Red Hat Regalia!!! Our chapter was assembled on January 28th, 2011. Our first event as the Social Butterflies was a luncheon at Marie Callendars. Vicky who is also the the founder and organizer of the "Purple Ball" which was held annually at the "Grand"
Internet based "Purple Closet" where you could find all your Red Hat needs. The Social Butterflies currently has 36 members. We have since limited our membership to 40 ladies. "Contact Form" below or email the Queen Mum with your information. Note that SB no longer accepts Queen's of other chapters. What Is The Criteria To Be A Member? Membership criteria to be in the Social Butterflies can be found on the "Membership" page. are welcome to join, too! makes the group a success! Members also must hostess at least  event every other year. chapter in Long Beach, CA. 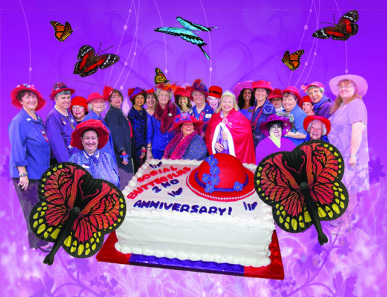 All our members MUST be registered with the Red Hat Society. other local Red Hat groups and we are now extending invitations to partake in our "Chapter Events" by email or on the RHS page. chapter events that we attend. Our chapter has 2 planning meetings a year to plan events and update our "Calendar of Events." fulfilled and liberate ourselves from the everyday humdrum! Red Hat Social Butterflies Gals Just Want To Have Fun!!! email it to our QM. and explain our SB chapter. We do not charge dues in lue of our "Flutter Fund"
Be sure to contribute to it at our events. Queen of "Too Hat To Handle"